In class today I was teaching a diamond fold card I had made previously. I made a card base myself to demonstrate the method and after class I used the Star of Light Bundle to quickly finish the card. I added a layer of Silver Foil Sheet followed by a layer of Basic Black cardstock. For the side pieces, I heat embossed the swirl in silver before I stuck them into position. I heat embossed the star onto Silver Foil Sheet using the lovely Red Glitter Embossing Powder before cutting it out with the matching die. 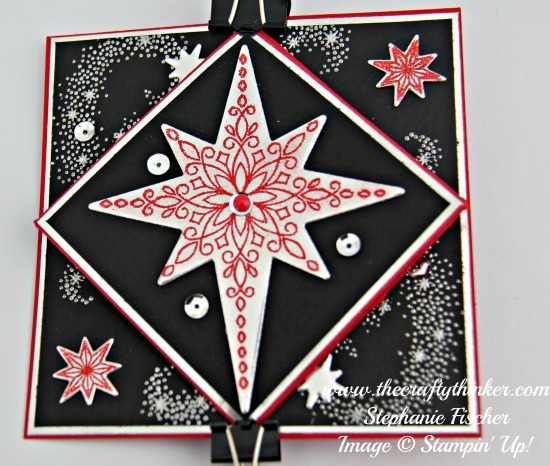 I adhered the star to the centre of the card and added a few silver sequins from the Metallic Sequin Assortment. I placed a silver sequin to the centre of the star and placed a Real Red Enamel Dot into the middle of it. 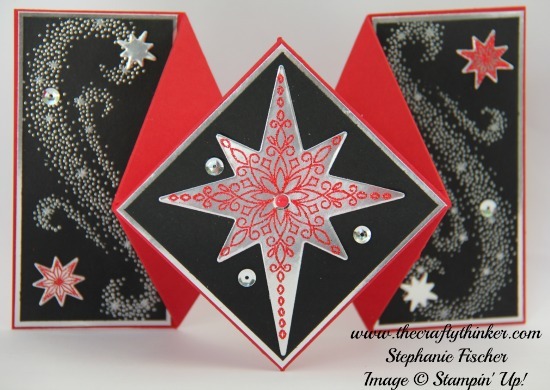 I heat embossed two smaller stars in the same way as the large star and cut them out with the matching die and I also used the smallest star die to cut some Silver Foil Sheet. I adhered these to the side pieces with some more silver sequins. The card is so bouncy that I had to used clips to hold it closed for the photograph!